We flew to Vegas to take advantage of the good air fares, cheaper car rentals, and lower hotel prices...Disney for adults, and all that. I came out $4 ahead over the days we were there, gambling a quarter here and there, and winning $20 when I'd thrown away about $16. If culture is the opposite of nature, then Vegas is the most "cultural" city on the planet, using every variety of manmade simulacrum to induce people to play manmade games with arbitrary rules to redistribute the most abstract human possession: money. Hated it. Loved it. But we really needed to get out of town after 2 days of it. It is a great people-watching town, and perfectly placed to stage a Western vacation. F's real introduction to the western landscape came the second day into the trip--a visit to Red Rock Canyon just outside Las Vegas. 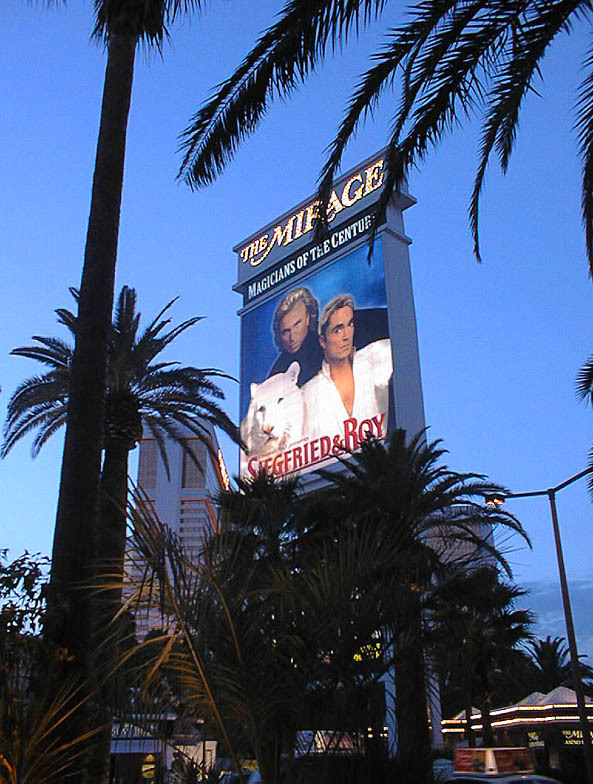 We skipped Siegfried & Roy.